Over the last 10 years, Zeus Jones has gone through significant evolution, from a startup with just a few employees, to a small company 50 strong. At this stage, a lot of companies pursue one of two paths: 1) grow and sell or 2) maintain the status quo until the founders get bored or retire and well… sell. However, the founders of ZJ have always had a vision for it to exist as an independent company, owned and operated by successive generations. And their hope was that those generations would contribute new and diverse perspectives beyond those of the founders, and come armed with a mission that allowed them to build on already solid foundations, continually evolving the company and pushing the boundaries for what ZJ could be. Brad, Peter and I have been incredibly fortunate to have worked alongside ZJ’s founders for the last 10 years and are excited (if not a bit terrified) to start building the team that will be the first of these successive generations to take the reins. The founders are handing over the keys at a pivotal place in our history. We’ve grown to include a wide range of people that bring broader skills, experiences and perspectives to the table, and we’re being asked to solve larger, more interesting and more complex problems for a wider variety of businesses. In order to solve these problems and service a wider range of clients, we needed to create a leadership structure that would allow us to get the most out of these new opportunities and leverage the newfound talents of our staff. A lot of management structures today are based on things like functional roles, departments, client categories or geography. There are often layers of teams that report up the ranks to a few people at the top. While that kind of structure has its benefits, it rarely allows for innovation, largely because it fails to empower the people who actually do the work. It’s our goal, instead, to reinforce leadership that focuses on bringing cross-functional teams together, pushing boundaries, setting people up for success, developing new skills and perspectives, and exposing us to new problems to solve. Growth & Mentorship: Our greatest strength is our people; we want to figure out how to help people set goals, work toward them, receive feedback on their progress and be exposed to learning opportunities along the way (this is especially challenging in a shallow hierarchy like the one at Zeus Jones). 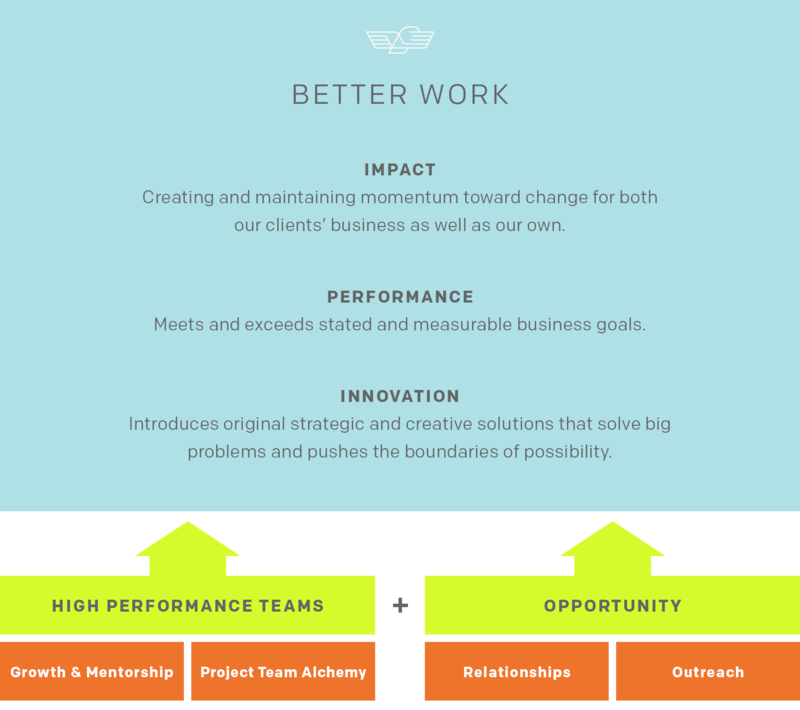 Team Alchemy: We want to do a better job creating project teams that are thoughtfully constructed and set up for success. This means aligning talent to task (and availability) and making sure that teams work well together, which will, in turn, create opportunities for people to step up as project leads and expose others to new challenges that support individual growth and learning. Relationships: To continue to create new opportunities, we want to make sure we’re strengthening our existing relationships and looking for new relationships that will help us explore our potential, within marketing and beyond. Outreach: We want to find ways to broaden our influence and exposure to new opportunities by pursuing recognition for our work, our people and our way of thinking. In the future, we expect to identify additional focus areas, creating new opportunities for people to step into leadership positions and drive change across the organization, but these four current areas of focus represent the foundational elements we feel will help us continue to evolve. We didn’t want to create small independent teams that excelled in specific areas. Instead, we looked for one or two people to take leadership roles in each focus area and then work with leaders in the other areas to create a cohesive, collaborative team. We didn’t want to simply create a team comprised of department heads or people with the most tenure. We see Zeus Jones as a collective of incredibly talented people with diverse experiences. That means Focus Area leads need to be able to represent that diversity and feel comfortable contributing ideas across disciplines. The goal is to further blur the lines between departments and encourage people at every level to step up and drive change. We wanted the people focused on these objectives to stay actively involved in daily client work so they could remain close to the impact their efforts were making. Finally, we wanted most of all to surround ourselves with people who embodied the leadership qualities that we held in high regard, who would contribute to our overall alchemy by complimenting each others’ experiences, and who would challenge our assumptions and push us to think differently. 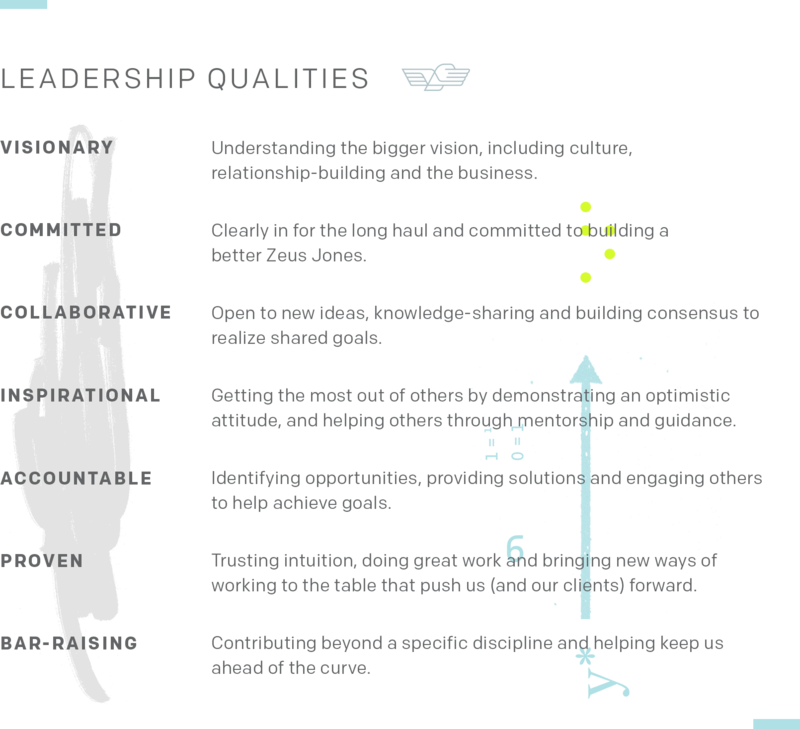 The people we asked to help lead are those we felt best represented the qualities above. We think we’ve got a pretty amazing team in place and can’t wait to see what the future holds. We’re already seeing a renewed sense of energy and excitement around the office. It sorta feels like the good old days, but in a completely new (and even better) way. Infographic: How Does The Twin Cities’ Advertising Industry Stack Up For Women?